Just two more countries to go and Effie is struggling. Well, only in the sense that we have the same problem that’s plagued us throughout the trip – the back hub & spokes. I’m only doing about 20kms an hour and it’s at the point where major repairs are urgently needed. The noise makes my teeth chatter but I’m determined we’ll do it under our own steam. So we’re cautiously making our way back to the Czech Republic, this time to Prague, where Libor is waiting to help with welding the spoke flanges and redrill them. Then we’re home sailing! But I’m getting ahead of myself here, so back to where I left off…. So where were we? That’s right, Slovakia. Near Bratislava a chauffeured car stopped and the passenger asked if he could take some photos. Nothing unusual about that, it happens all the time, but then he said he’d been following my blog and would like to be a minor sponsor. My view is that any kindness shown, be it an offer of assistance, a place to stay, some food, or as in this case, a generous donation, they’re all fantastic. A few people have added to the travel coffers and it’s really appreciated, especially when I’m often down to my last Forint or Lev. That’s until I can find another ATM. Sometimes locating one of these is as hard as remembering what day it is! I rode into Vienna on a miserable day and trying to negotiate the tram tracks in the rain took some doing. By the time Lynne joined me I was settled in our accommodation, showered and able to relax. Sometimes it can seem like weeks since I had a decent bed, but it’s usually only about a week. The weather cleared and the next day was spent wandering around the city ogling at all the beautiful buildings and enjoying a free classical concert at the Housdermusik. The open horse-drawn carriages, leafy parks, wide avenues, trams and amazing metro/tram system make it easy to get around this lovely city. While we were here the Hungarian program on SBS Australia called and did a phone interview. Nice to know there’s some new folks back home following my odyssey. A couple of days were spent cleaning gear, catching up with paperwork and photos before slipping out at first light and heading north east to Brno, in the Czech Republic. Route 7 kept me off the motorway and given it was a public holiday the traffic was light. I camped 50 kms before Olomouc when a passing motorcyclist stopped by and mentioned a vintage rally happening 200kms away in Poland on the coming weekend. It wasn’t out of my intended route to Krakow so I accepted the invite and agreed to join him. That’s the neat thing about not having any fixed plan as it means I can deviate here and there to see whatever is on offer instead of following a rigid timetable. Traveling on the E462, I learnt this area was the scene of Napoleon’s biggest battle. Some 30,000 soldiers lost their lives. It’s hard to imagine the peaceful region witnessed so much bloodshed. I guess that’s the same the world over, grass grows, buildings are replaced and life goes on, but the sad memories remain. Lynne & I had heard the stories of how the Hungarian invasion took place and we tried to imagine what it might have felt like to see Soviet tanks rolling down the streets on a day like any other. How fortunate we are to have never been affected firsthand by such horrific events. After stating recently I don’t usually like to carry maps, a nice guy stopped and gave me a book of European maps, so now there’s no excuse for being lost again! I’ve been enjoying the meandering countryside with gentle hills and Effie seems to be in her element. Near Brno, I met up with Jakub who took me home, introduced me to wife Helen & their friends. Together we enjoyed a great BBQ, drank a few beers, probably more than I’m used to, but given the Czech Republic is renowned for its ale, it wouldn’t be polite to turn down a beer or two, now would it? Thanks Jakub & Helen for a terrific time & your friendship. Just as I was getting away the phone rang and a guy on the other end said his friend in Prague had told him to find the ‘madman on a motorcycle’. Jifi restores old bikes and rode with me for a good part of the day and he was able to show me an interesting route. http://www.oldtimer-helfstyn.cz/ Despite more rain, it was a pleasant ride, apart from Effie missing a bit – she doesn’t like the wet, but a squirt of WD40 keeps her going. I stopped at the Technical Museum Tatra at Koprivnice where the curator kindly gave me a personal tour of their great collection of vehicles and we posed for pictures in front of the museum. After crossing the border into Poland I made inquiries about the rally at Bielsko Biala. Well, apparently the date I was given was wrong and it’s already happened! Not to worry, one of the locals took pity on me and invited me home for the evening. Well, as they say, the best laid plans of mice and men… The road was one way and by the time I worked it out I was too far gone to turn back. What was I saying about never getting lost? So now I’m heading back to the Czech Republic, and Prague, some 600kms away. Apart from the back hub, there are a couple of other things that need attending to. Push starting at the lights the other day, I jumped too heavily on the pedal and it fell off! So that’s one of them. I managed to pick up a horn along the way so having one that works is a relief. That’s one less thing for the police to pull me over for. I happened to click on my little bicycle speedo the other day and it showed that since we left Kathmandu Effie has traveled more than 12,000kms! Amazing. Once she has her hub attended to and her pedals repaired, she’ll be like new. Well maybe not new, but she’ll get us to Bernkastel and that’s the main thing. Only 26 days to go and counting! As my friend Jeff would say, EEEEH, HAAAA You can do it Effie, I know you can girl. You are amazing. There are no words for you. Only a few men know what is to ride with throttle and advance, no brake in front.. and if was hard in that times, clutch was something not ready for actual traffic lights. My only experience is with Indian Scout 600cc 1926, and a small bicycle 150 cc from 1913. You are inspiration to all of biker dreams. As I see also for your family. Take care and keep going. We are all in your back sit, pushing a bit in one of the 4 cylinders you have. Thanks for make our small world happier. I might need you to push a bit harder! The poor old girl is on her last legs. You’re right, this isn’t the easiest bike to ride and it’s the towns that cause the most headaches. I’m managing to avoid the cities as much as possible and the motorways. Hang in there with me – we’ll do our best to make it to the home stretch. Hope you’re still getting to enjoy plenty of riding. Hi girl. Thanks for your Father’s Day wishes and lovely thoughts. Been a long time since we saw each other, hope we can get together one day soon. Firstly a huge hug and kiss from your son on Fathers day (Australia). I can not believe the trip is so close to its end. But when one journey ends, another must start. It’s been quiet on your posts so hopefully this is a good thing and your taking in the country. Looking forward to your return (whenever that will be) to listen to all the stories. Your a inspiration to most of us. Thanks to you all for your kind words and encouragement. Look forward to getting together over Christmas maybe. All’s well and a new post going up today. A lot of catching up to do with mail and blogs etc. Love you all. Hi Ron, what an incredible journey you’re undertaking, you really are an inspiration! How on earth did you survive Indian roads – I remember wanting to buy an Enfield Bullet when I was there in the 1980s but chickened out after experiencing the traffic. Hope you’re enjoying your time here in Czech, good luck with the rest of the trip. Yes, I’m enjoying the Czech Republic. LOL, I know what you mean about the traffic in India – it can be pretty intimidating and I guess it wasn’t much better back in the 80’s. For me, a few years spent driving in Bali helped – it’s pretty insane on the roads there too. Mind you, big cities here are hard to negotiate on the FN given her primitive braking system, but we manage. Thanks for your good wishes Simon. 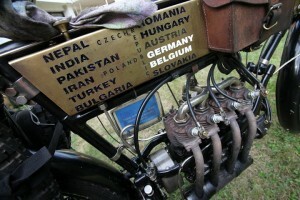 Hi Ron, I came across an article about you and your trip on czech motorcycle server http://www.motorkari.cz/. I’m surprised it took them so long to notice you’re around 🙂 However there’s a few photos of you and Libor from Libor’s workshop doing some serious business on Effie’s engine. Good to see everything is back in normal now 🙂 Enjoy your stay in Prague! Yes, thanks to Libor’s help Effie is sounding good again. Just have to get her back wheel in shape, which we’ll get onto today. Have enjoyed the city and now it’s down to business before I cross the border into Germany in a few days. I’ve noticed from the messages that you may be visiting Sinsheim. If you do it will only be a cats whisker from the Bertha Benz memorial route, which I know you would love to include in your marathon run. Please let me know as you will be so close ot our home. I would still love to meet up with you, in spite of my family problems. If you let me have your email address I will give you more details. I dont want to publish them on your blog. Keep going my friend you are almost there….green with envy I am. I definitely want to do the Bertha Benz memorial route so have included that in my itinerary. I’ll email you privately so we can arrange to meet up. I’ve had a few problems recently but with help from some great people we’re still chugging on. Just a few more days in the Czech Republic and I’ll be heading to Germany, with a bit of sightseeing in the s/e region before the rally. Speak to you soon. You are really getting near now, I look forward to meeting you in Belgium, where your FN will return, probably for the first time since it has been born here ? It was in Liège at 100 years of FN, in 2002, that I met Libor Marcik a few years ago, a tremendously enthusiastic man, I’m glad you met him on your road. My wife Patricia has just finished our local pre-1920s run in De Haan on my 1907 FN, 60 miles (a minor effort for you…), which went flawless. The quality remains. Very best regards from Ostend, Belgium coast. I look forward to meeting up in Belgium and sharing FN stories. Great that you got to meet Libor. I agree he is a very passionate guy when it comes to motorcycles. He has an amazing collection of motors on display and has written several books on old bikes. I enjoyed my time with him very much. Congratulations to your wife on her recent achievement – it’s no small feat to ride an FN even though they’re reliable. I’m having a few days relaxing at a campground and tinkering with the bike. I’m hoping the weather improves as the skies look a bit threatening. Thanks for your continuing interest Nick. Is Lynn still with you ? Enough of the ‘old’ son! I’ve got another adventure left in me yet – coast to coast in the USA next year I think. Maybe we’ll get to catch up again along the way. Lynne’s in Spain, but we’ll see each other again in Germany in two weeks time if all goes according to plan. Hi Ron, How is it with Effie and her engine troubles, did you make it to go to Libor, I’ve send him yesterday evening a mail after I read about the cylinder troubles, but today no news on the twitter??? So let us hope no news is good news, or must we look for other help??? Yesterday definitely wasn’t one of my better days but I managed to gently keep Effie going with really low power and rode 90kms today. Libor came to meet me – did 300kms would you believe? What a fantastic guy. I’ll get started early in the morning stripping the bike down and she’ll be looking good for the last leg. Having access to Libor’s engineering shop will make all the difference. Thanks for your concern Jacques & for putting out feelers for me. A couple of days and once Effie is restored to health I can take in the sights of Prague. It seems like I’ve been in Europe for ever! Not far to go now. I’ll admit it does take a good understanding of the FN to get this far, (13,200kms today) but I have to say that although some things are diabolical about the engine, it certainly has done a fantastic job. Sounds as though you’re making good progress. Maybe I’ll get to see your bike going when I return? Good luck with the rest of the restoration. Thanks for your encouragement Wal. Keep on going Man ! The Finish Line is close ! Just another 1000 kms to go to Bernkastel ! In case of any probs around Mannheim, you may call my friend Thomas Rothacker of http://www.US-Classic-Bikes.de. He has his repairshop near Sinsheim (Remember: Technik Museum) and would be glad, if he can be of help if needed. But even more glad, if you dont need his help and Effie would run smothly until the very end. ;-)) You find his phone nbrs on his Webpage. Looking forward to meeting up soon and thanks again for all your support. We’re getting excited and we’re not even there…!!! We can FEEL the thrill of your near-achievement through your words. Go Ron…and Lynne. Feels good to be so close. Wouldn’t have made it though without the wonderful support I’ve received along the way and the encouragement of guys like yourselves. Thanks.